Student evaluations of the new Doctoring program and the Chief Concern course, in particular, far exceeded expectations during the first year. Among the new curricular elements launched in 2015 were the M-Home learning communities, a rich network of peers and faculty bonded together through service learning, educational enrichment and wellness that spans all four years. Doctoring, a course where small groups of 12 students and two faculty members learn clinical skills and professional competencies essential to patient-centered care, was also launched. Other additions included: the Initial Clinical Experience, a longitudinal inter-professional course where students learn about health care teams and systems directly from practicing providers; Chief Concern, a course focused on teaching students the art of clinical reasoning; the Leadership Program, which embeds leadership training through a variety of action-oriented learning experiences; and the Paths of Excellence, a feature of the curriculum that allows students to pursue personal interests in diverse areas such as ethics, medical humanities, scientific discovery, global health and disparities, health policy and economics, and innovation and entrepreneurship. Of course, the real test of success will be when we look at this group of students as they enter the clinical environment and see how these courses impact their performance. —Michelle Daniel, M.D. Now, curriculum transformation leaders such as Michelle Daniel, M.D., assistant dean of curriculum, are reflecting on the debut of those new elements. Student evaluations of the new Doctoring program and the Chief Concern course, in particular, far exceeded expectations during the first year.A year ago, the University of Michigan Medical School launched phase one of its much-anticipated Curriculum Transformation, designed to create physician leaders who can affect positive change in an evolving health care system. 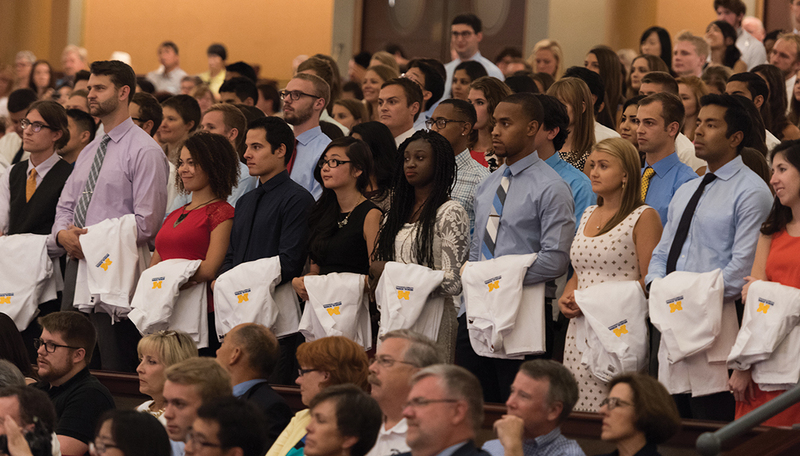 In May, the class of 2019 completed the new M1 year. Also under development is the Clinical Trunk, in which students will engage in departmentally based clinical rotations, immersed on health care teams. Pilots have also begun for Professional Branches, including a select group of students striving for impact and excellence in their fourth year. These students are pushing the limits of traditional medical education with innovative projects, ranging from writing a book to travelling to far reaches of the globe to find a cure for blindness. Beginning this fall, the entirety of the new curriculum will be implemented, but Daniel notes, “Curriculum reform is a process.” U-M leaders are constantly evaluating the new programs, making tweaks and changes, and responding to feedback.